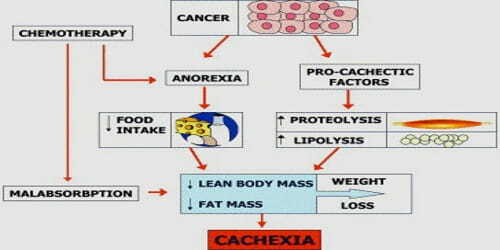 Definition: Cachexia, or wasting syndrome, is a disorder that causes extreme weight loss and muscle wasting, and can include loss of body fat. 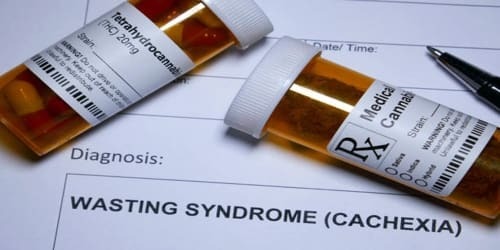 It is seen in people with cancer, AIDS, coeliac disease, chronic obstructive pulmonary disease, multiple sclerosis, rheumatoid arthritis, congestive heart failure, tuberculosis, familial amyloid polyneuropathy, mercury poisoning (acrodynia), Crohn’s disease, untreated/severe type 1 diabetes mellitus, anorexia nervosa, and hormonal deficiency. Cachexia occurs when the body of the sick person releases certain substances that keep new muscles from growing. Thus, even when they eat more, they find it very hard to gain weight. Without enough muscle mass and energy, many patients are too weak to undergo any form of treatment. This can further worsen their condition and their prognosis. Precachexia is defined as a loss of up to 5 percent of people’s body weight while having a known illness or disease. 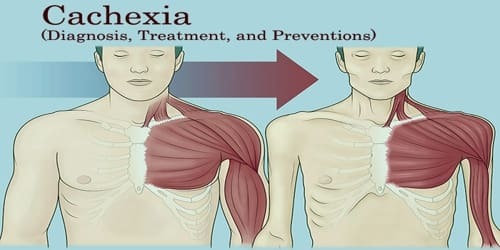 Cachexia is a loss of more than 5 percent of people’s body weight over 12 months or less when they are not trying to lose weight and they have a known illness or disease. Refractory cachexia applies to individuals with cancer. It is weight loss, muscle loss, loss of function, plus a failure to respond to cancer treatment. Cachexia is a positive risk factor for death, meaning if the person has cachexia, the chance of death from the underlying condition is increased dramatically. As a result of these complications, people with cachexia have a lower quality of life. They also have a worse outlook. There is no specific treatment or way to reverse cachexia. The goal of treatment is to improve symptoms and quality of life. Therapy that includes regular physical exercise is recommended for the treatment of cancer cachexia due to the effects of exercise on skeletal muscle. Cachexia occurs less frequently in HIV/AIDS than in the past due to the advent of highly active antiretroviral therapy (HAART). Medical marijuana has been allowed for the treatment of cachexia in some US states, such as Illinois, Maryland, Delaware, Nevada, Michigan, Washington, Oregon, California, Colorado, New Mexico, Arizona, Vermont, New Jersey, Rhode Island, Maine, and New York, Hawaii, and Connecticut. In most cases, eating more and exercising are not enough. This is because patients are also dealing with other diseases that have a negative impact on their body. In such cases, doctors recommend a form of treatment (palliative care) that focuses on improving the patient’s quality of life instead of trying to cure the underlying disease. This is often seen in patients with an end-stage disease where little can be done to stop it from worsening. Preventions of Cachexia: Cachexia is usually a side effect of an underlying medical condition, so the focus for prevention lies in keeping the underlying chronic condition at bay. Some conditions, such as COPD or HIV, are potentially preventable. The prognosis for patients with cachexia is usually poor especially for those who have certain types of cancer. Most forms of cancer treatment cause patients to lose their appetite and become nauseated most of the time. With decreased food intake, patients tend to lose even more weight. This prevents them from making a full recovery.